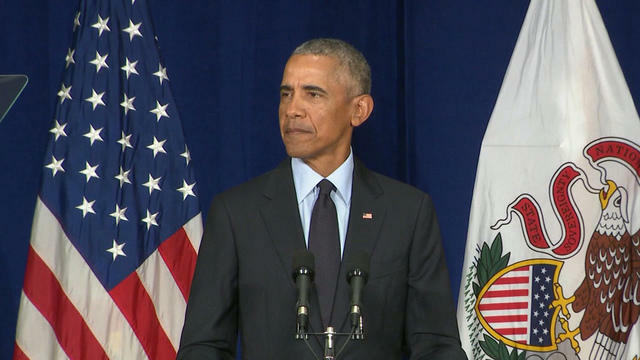 Former President Barack Obama stumped for Democratic gubernatorial candidate Richard Cordray and other Democrats Thursday night. Cordray, the former federal consumer watchdog, faces Republican state Attorney General Mike DeWine in one of the season's most anticipated governor's races. President Trump visited Ohio in August to campaign speak at a rally for DeWine. On Thursday night, Obama blasted President Trump and the Republican Party under him, saying as he has before that they are appealing to lesser instincts. "They appeal to our tribal instincts. They appeal to fear," Obama said of the GOP. "They try to pit one against another. They try and say border security, we'll keep out those folks who don't look like us or sound like us. That's a playbook as old as time." Republican Gov. John Kasich is term-limited, and Democrats, who are currently out of power at every level of Ohio government, hope to win the governorship. The appearance is part of a swing across the country by Obama to boost Democrats' efforts to win House seats and state elections. Obama kicked off his midterm campaigning earlier this month with a speech at University of Illinois at Urbana Champlain. In this speech, he urged people to become active, saying "you need to vote because our democracy depends on it." He also decried the Republican Party, saying that Mr. Trump was a "symptom, but not the cause" of extreme partisanship in the country. Obama's second campaign appearance was at a rally in Anaheim, California, on Saturday in support of seven Democratic congressional candidates in largely Republican Orange County. He spoke for a much briefer period than in his address the previous day. "They stepped up, they're fired up, they're ready to go," Obama said about the candidates, repeating a campaign slogan from his 2008 campaign. Obama released a video last week outlining his case for the midterms. "We're in an urgent time. We've seen basic norms and principles that have served us well for decades increasingly violated, not to mention policies that have skewed towards the wealthy and powerful," Obama said in the video.